Looking for a way to keep herself busy, Gloria started working in Kingsbury as part of the resident volunteer stipend program in the Kenyon Hodges Computer Learning Center six hours a week. At the center Gloria learned about the satellite program of Daylight Twilight High School and she quickly started her studies to earn her high school diploma by going to class three days a week at the center. In June 2004, Ms. Lewis finally wore her cap and gown and received her High School Diploma almost 30 years later than she had originally planned. She knows that living at Twin Towers and having the KHCLC available made it possible to achieve her dream of having a High School diploma. Currently, Ms. Gloria, as the children call her, continues to be a volunteer at the KHCLC helping the children with homework and supervising the summer time programs and trips. She continues to be active because the center is so close to home. 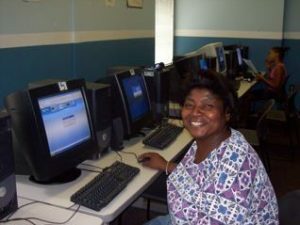 When not working at the KHCLC, you can find Gloria spending time with her friends playing computer games, showing them things she’s learned on the computer or attending Game Night. Ms. Gloria says that “she loves the kids and the computers” and that’s why she keeps coming back.